In the past, the Cochin Chicken was known by the name of Chinese Shanghai. These birds are mainly bred for ornamental purposes, but they are also bred as meat birds, as well as egg layers and foster mothers. Even if most see the ornamental perspective of the Cochins, they are undoubtedly excellent foster mothers and they are sometimes used for other breeds and even species. Egg-laying at Cochins can be irregular, oscillating between huge amounts in short periods to no egg in several months. 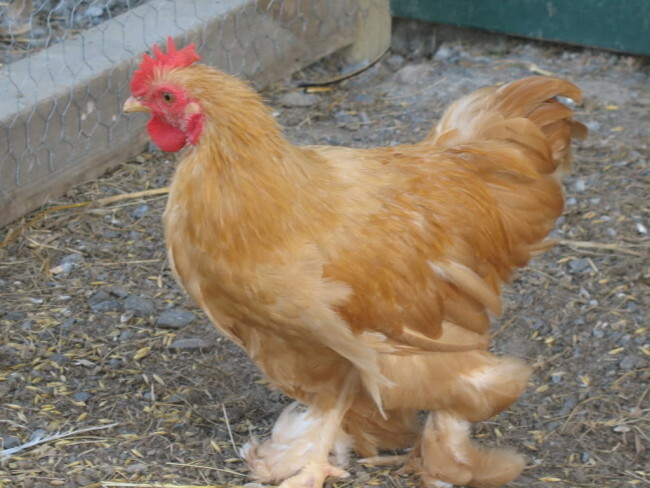 The abundant, dense plumage of the Cochin Chickens is what makes them so incredibly appreciated and provides the amazing look. Their look resemble to a large feather ball, which encloses their feet and legs as well. This makes it a requirement not to keep these birds in mud during rainy weathers, as dirt can gather up in their plumage. It is not solely the plumage that builds up the impression of a big bird, but it is a large bird even underneath the feathery cover. The skin of the Cochins is always yellow. The plumage can come in several color varieties such as black, blue (dark shade of blue), golden or buff, white, silver (actually more like a very light blue), partridge (a charming combination of rust, black, red and darker gold colors) and silver laced (light silver feathers, laced in black, providing an absolutely amazing display). All these colors can also come in the frizzled version. The Bantam Cochin’s color pattern can range up to fourteen different variations, although not all of them are considered standards, thus also not allowed in the show rings. The eggs are usually brown. The origins of the Cochin reside in China, the starting point for later exports to America and England, towards the end of the nineteenth century. They gain popularity no early than 1886, when the breeding processes undertaken by the English and the Germans became more intense, leading to the period being named the ‘Cochin Craze’. Nowadays, the Cochins are also used for meat. The younger the Cochins are, the more heat they require, as the plumage is underdeveloped at early ages. Until they are adults and the plumage gains the normal density, the temperature interval should be between 37 and 41 degrees Celsius. It is only with the growth of the plumage that the temperature needs to be gradually decreased. A recommended diet for the Cochins is a hardboiled eggs mash. 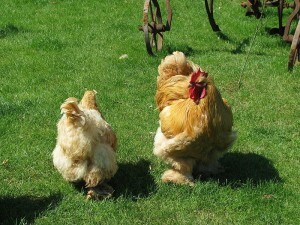 Distinguishing between males and females Cochins is relatively easy, as females have smaller combs and wattles.